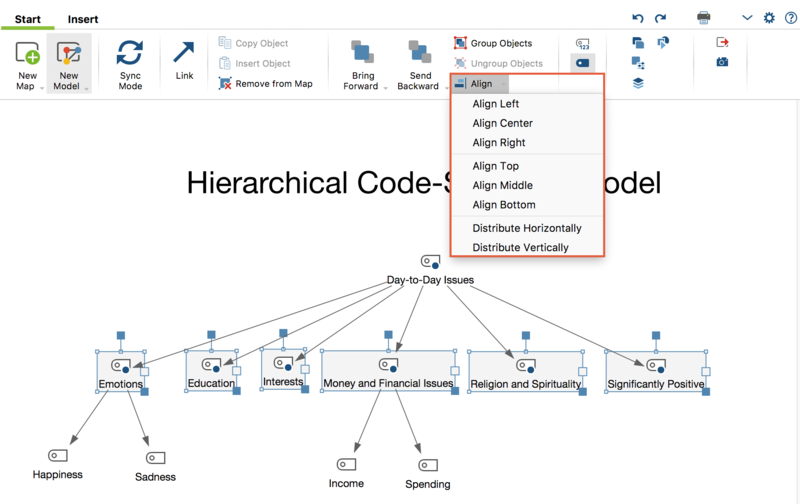 You can easily customize the look and position of objects to create a map that suits your analysis. To do this, you must first select the objects you want to customize. Click an object with the mouse, or drag a frame that covers multiple objects to select several objects at the same time. Selected objects are indicated by their additional blue frame. 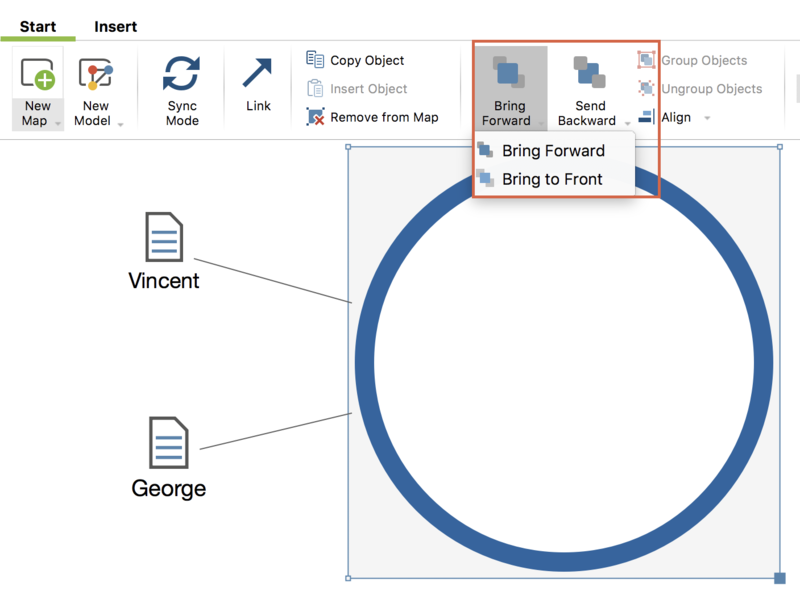 If several objects are already selected, you can add additional objects for selection or remove individual objects from the selection by clicking the objects while holding down the Shift key. Use the key combination Ctrl + A (Windows) and cmd + A (Mac) to select all objects on a map. You can move selected objects anywhere on the map. when Sync Mode is off, simply double-click the selected object. The window will appear the first time on the right side of the MAXMaps workspace the first time you open it. Using the icon in the header of the window, it can be released from its fixed position and placed anywhere on the screen with the mouse. The window remembers its position and appears there the next time. To lock the window back into the original position, drag it to this position with the mouse. You can also insert line breaks, which are then displayed in the label. In this tab you can determine the appearance of the icons in your map. If the Visible option is off, only the label of the object is displayed. Depending on the type of object, different shapes and symbols are available for the icon, e.g. the different document icons for a document in the “Document System”. To use an image other than the standard icons of MAXMaps for an object, click the button with the three dots and select any image from your computer. Tip: To hide all the code icons and work with only the code names on the map, it is not necessary to make the sicon invisible for each individual code. On the Start tab, you will find the Code Symbols option, which works like a switch: click the option to hide all the code icons, and then click the option again to show all icons that are visible. The layer on which the object is located. A frame around the entire object in any color. The rotation on the workspace from 0 to 359°. Whether the label should be displayed above or below the icon. External link – Click on the object to open a file. Click the three dots at the end of the entry field to select a file. Geolink – Clicking on the object opens a georefeence, which can be opened with, for example, Google Earth. Click the three dots at the end of the entry field to select a file. 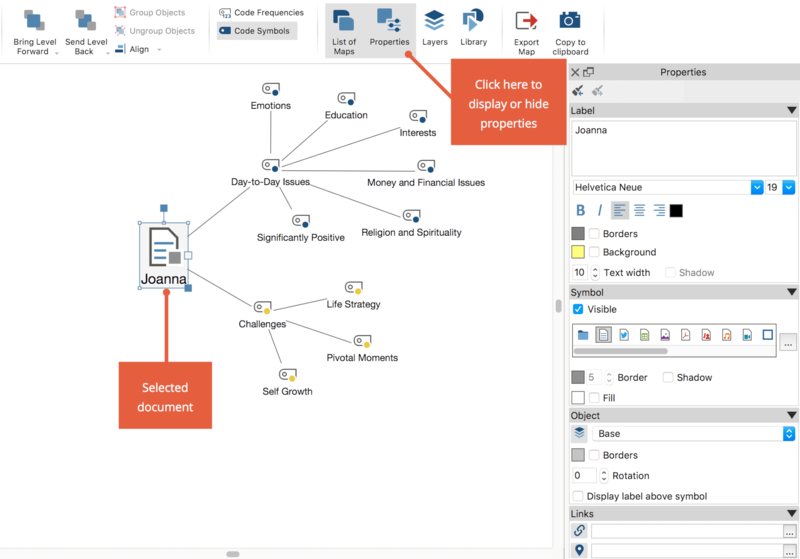 MAXMaps lets you transfer the format of one object to another. This allows for a more uniform appearance among different objects. The function is applicable to all objects including linking objects, and it also enables you to transfer the color and line type of one connecting line to another. Select the object whose properties you wish to assign to another object. Click on the option Copy formatin the toolbar. Select the target object, i.e. the object to which the format shall be applied. Click on the option Apply format in the Properties window. Subsequently, the same format can be applied to an arbitrary number of objects. You can do this simply by selecting these desired objects and then choosing the Apply format option. You can copy individual free objects to an internal clipboard of MAXMaps using the function Start> Copy Object. Via Start> Insert object, the objects are inserted into the next free space from the upper left into the map and their design is preserved. Click on the blue point on the right lower selection frame and pull the object larger or smaller with the mouse button held down. Hold down the Ctrl (Windows) or Cmd (Mac) key and rotate the mouse wheel. Click the magnifying glass icons or the status bar that you use to adjust the zoom settings of the workspace. The size ratio of icon and label to each other can be influenced by the selection of the font size for the object properties. 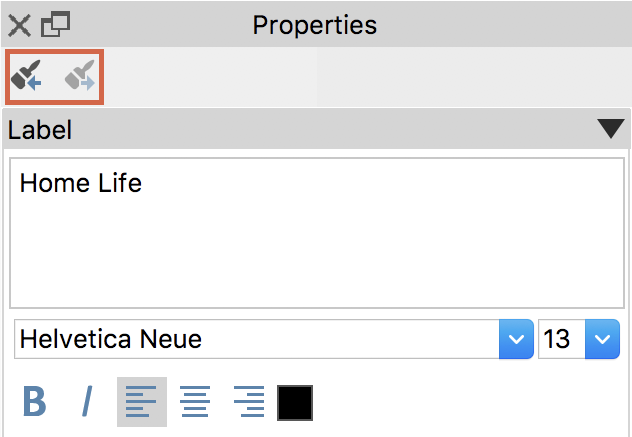 Double-click a text in the workspace to edit it. Hold down Shift und and press Enter ↩ at the same time to insert a line break. Objects can be grouped so that their distances remain constant. To do this you first have to drag a frame around the objects with the mouse. As an alternative, you can also select individual objects to be grouped by clicking them one by one while pressing the Shift⇧ key. In the same way, the selection can also be undone for individual objects. In the Start tab, click Group Objects, your selection will become a fixed group. Alternatively, the option is also available after right-clicking on one of the selected objects in the context menu. The objects of a group can’t be selected individually, but are always selected together. A change of object properties in the Properties window has the same effect on all objects in the group, including changes in the size. The group can be split up by clicking on the group and then clicking Ungroup objects in the Start tab. Alternatively, the option is also available in the context menu for the group. Click the object with your right mouse button and select Change Image … from the context menu. Instead of the default icon, you can now use any other image. The image formats JPG, PNG and TIF are allowed. Alternatively, you can change the icon to a different image or symbol in the Properties window by clicking the button with the three dots in the Symbol tab. To design a map in such a way that it reflects your ideas, you need to be able to determine which objects should be placed in the foreground. Click the object you want to move. You can also select several objects at the same time with the mouse. Click the Bring Level Forward or Send Level Back icons in the Start tab to arrange the sequence of your objects in the map. By clicking on the arrow below these icons, the options Bring to Front and Send to Back are also visible, which place an object all the way forward or back. Alternatively, click on an object with the right mouse button and select one of the positioning options in the Arrange menu. This menu also displays the key-shortcuts, for example ⇧ + PgDown for “Move to back”. The objects can be aligned horizontally, vertically or equidistant from each other. The orientation of the objects always refers to the currently visible blue selection frame.